We’re doing lots of little holidays this year. It’s nice being able to spread out the anticipation and the fun, and the glorious weather we’ve been having makes it ok that they’re all in the UK. Last week we went on C’s first camping trip. G is already a fan of camping, and of course knows all about it thanks to Peppa Pig (who says kids don’t learn anything from TV!). And I have to admit, although I never thought I’d say it, I’m a convert. You won’t find a hotel where the kids can run off and make friends to play with before you’ve even unpacked your bags. Last weekend was slightly different in that we weren’t on an official campsite. A very good friend of mine had organised a wakeboarding weekend in Oxford – a return in fact to the site of her hen do which I helped organise a few years back. We’d arranged to camp overnight at the water sports centre which was perfect. Sadly (?) there are no pictures of me attempting to wakeboard – a dodgy shoulder put paid to those plans. 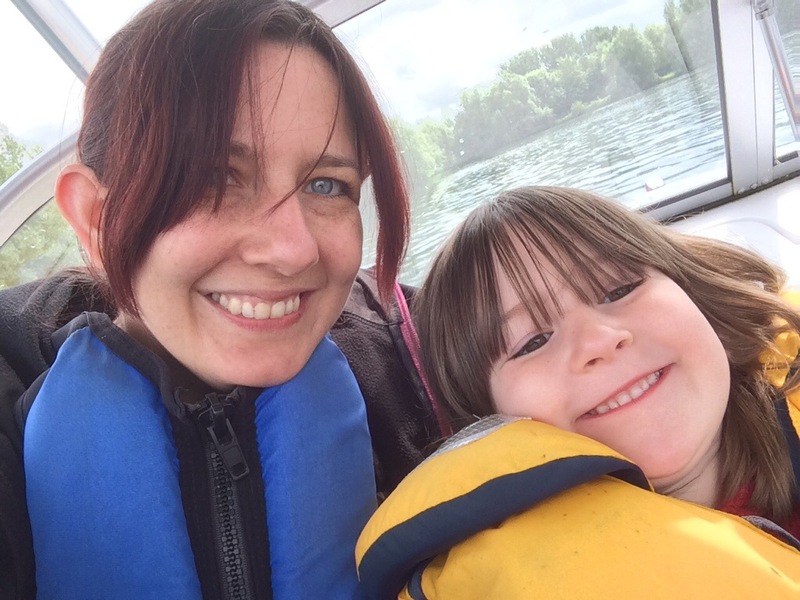 But G was thrilled to go on her first speedboat ride, then surprised us all braving the lake for a swim afterwards. 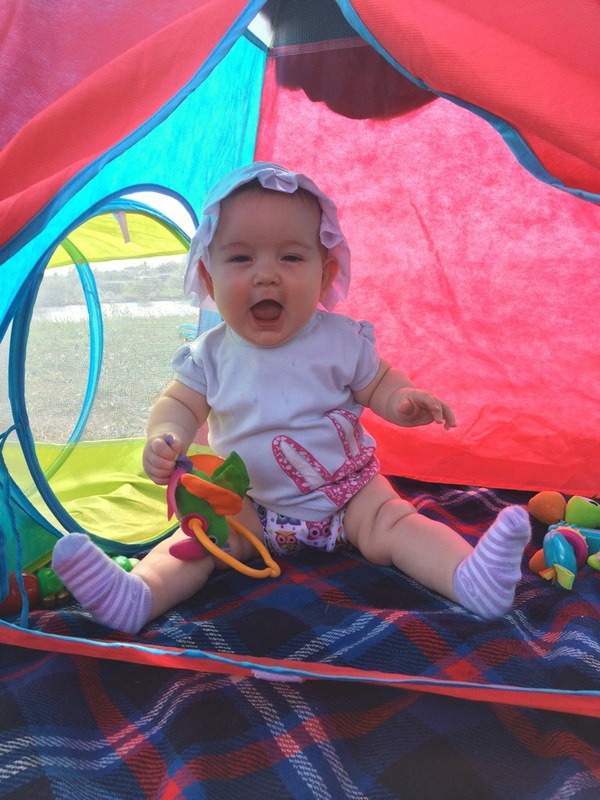 In the meantime, C cooed, gurgled and laughed away in her big sister’s play tent (which made for a handy sunshade). She’s pretty good at sitting up on her own these days, although she’s still showing no interest on being on her tummy, rolling or crawling. I like to think she’s just being lazy. She’s certainly learnt how to get what she wants – mostly by staring and ‘shouting’ at you until you pass it to her. C even got to join in a bit with the evening BBQ before both kids headed off to bed in the tent. Of course it was far too exciting to think about actually going to sleep so we all ended up tucked up together until I realised that I was the only one awake and made my escape. All three (yes three – it seems the big kid was also worn out!) slept pretty soundly until the morning, with a brief and well timed wake up from Daddy in order to catch the end of the football, huddled under the sleeping bag with the sound switched off. We decided against joining in with the early morning open water swim, and instead set about packing up for the trip home. But somehow despite being one of the first to start packing up, by the time we were loaded up everyone else had finished and were already heading off. It seems despite only being away for one night, we haven’t learnt how to pack light. Sounds like you all had fun! I think lots of little holls is the best way to go as well as it just makes the whole year fun (and life less stressful) rather than having one fab week and nothing for a whole year. You’re right, although we end up packing as much for one night away as we would for 2 weeks, it seems!